An adorable snail just for girls, featuring eyelashes! Two different snail designs as shown. 4x4, 5x7, 6x10, Durkee 9x9 Hoop. 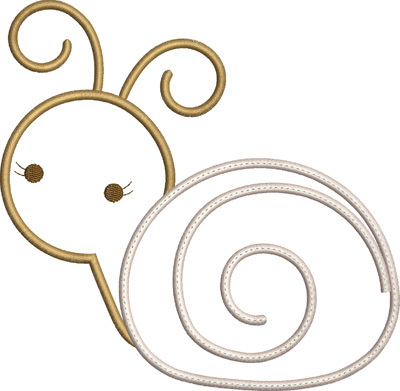 An adorable snail just for girls, featuring eyelashes! Two different snail designs included as shown. 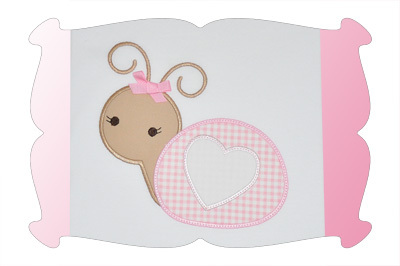 The "Girl Snail Applique" design comes in 4 sizes. All sizes included with your purchase! 4x4: 3.88 x 3.79. SC: 5690. 5x7: 4.93 x 4.82. SC: 7366. 6x10: 5.91 x 5.79. SC: 8942. Durkee 9x9 Hoop: 6.86 x 6.72. SC: 10,296.